As a great alternative to the treadmill, the elliptical offers a replication of the walking/running motion but without one major factor: the impact. Elliptical machines are designed to allow for minimal impact with no footfall action. Individuals with knees problems or spine related issues may find the elliptical machine more suitable to their exercise equipment needs. 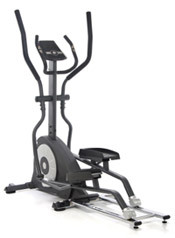 Elliptical machines are not as popular as treadmills but can be found in most gym as well as in home gyms. Due to the weight of these machines, it is often advised to have assistance when moving the device from one location to another.